Have you noticed your dog itching his body or feet? Does he have reoccurring ear and skin infections or possibly excessive gassiness? These may be signs that your pup has a food allergy and will benefit from eating a hypoallergenic dog food. Food allergies in dogs often go undetected because their symptoms are so similar to other conditions. Additionally, allergies can be triggered by environmental factors and not just food. If your dog is experiencing allergy symptoms, it is best to visit your veterinarian and confirm what is causing the problem. However, if your dog does have sensitivities or allergies to food, there are many great hypoallergenic food options on the market. Below you will find in-depth reviews of different hypoallergenic dog food products. If your dog starts displaying allergy symptoms, it is best to catch and treat it early before the condition gets any more serious. Below is a list of common food or environmental allergy signs and symptoms. If you ticked more than one of the above, do not treat your pet at home and visit your veterinarian. Only a pet specialist can accurately identify the underlying issue. Additionally, veterinarians can allergy test your dog to help find the root of the problem. What Are Food Allergies in Dogs? When a dog eats a food with an ingredient that causes an allergic response, its body triggers an immunologic reaction. In simpler terms, the body considers that ingredient to be a foreign invader and starts to attack it. The immune system produces antibodies when fighting disease or foreign invaders. However, food allergies occur when the immune system produces antibodies in response to a particular type of food. The body identifies this food allergen as harmful, even though it is not, and mounts an immune response. This causes the release of chemicals, such as histamine, which causes allergy symptoms. This allergenic response in dogs is similar to what happens if gluten intolerant people eat any food item that contains gluten. The main difference in dogs, the symptoms start to manifest immediately. What Can Be a Probable Cause of Allergy in Dogs? Dogs can suffer from not only food allergies, but also food sensitivities. Many dogs have a genetic predisposition for food allergies, but there can be different culprits. Dogs typically react to a specific type of protein which can come from animals or plants. The most common ingredients that trigger allergies are chicken, dairy, beef and wheat. Other probable allergens may include soy, yeast, lamb, and corn. One way to find out if it’s a food allergy is to try the elimination technique as recommended by experts. Start off by completely overhauling the dog’s diet with a hypoallergenic dog food. If symptoms subside for a couple of weeks, then slowly reintroduce the old foods one ingredient at a time. Closely monitor your pup to see if any symptoms reoccur. This method helps narrow down the precise food that is causing the allergy. When using this method, please consult with a nutritionist or vet, because eliminating certain foods may result in nutritional imbalances and may not always identify the underlying problem. Hypoallergenic dog foods are an anti-allergenic food for dogs that usually contains a new source of protein that the dog has not previously been exposed to, along with a single new source of carbohydrates. There are many varieties of hypoallergenic dog foods like pea and duck, lamb and rice, venison with potato and so on. These new protein sources do not trigger the dog’s immune system and hence, there is no allergic reaction. If you are looking for a hypoallergenic dog food for your pet, here are some recommendations. Below is a list of some of the most popular brands. These are frequently used by pet parents and have been handpicked on the basis of their ingredients, their benefits, and their popularity. Tested by veterinary nutritionists and approved with scientific rigor, Hill’s dry dog food is ideal for pooches with sensitive stomach and skin. It has real chicken meat as the primary ingredient. Moreover, Hill’s dry food is packed with antioxidants that regulate bowel movements and treat underlying skin allergies. The formula is easy-to-digest and free from preservatives, colors, and artificial flavors. 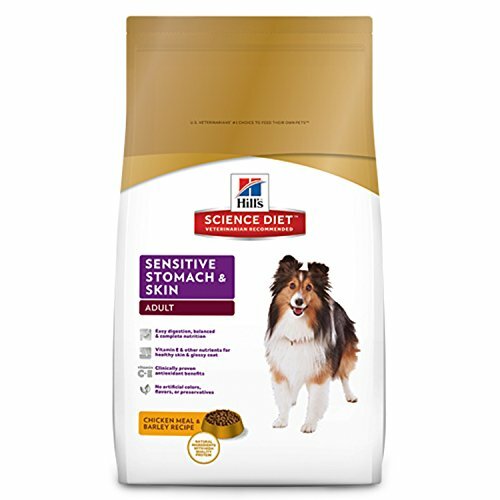 If you are looking for a skin and stomach-friendly dog food on a budget, consider Hill’s dry variety. Do I need a prescription to purchase this food? Some veterinarians sell this food, but pet owners can find it at specialty pet food stores and online. Just like Hill’s nutritious formula, Wellness offers a slew of great formulas that contain healthy ingredients on a budget. Take note that many vets now prescribe Wellness dog food due to the use of high-quality meat and no fillers. You can find five different formulas. Some of the choices are duck and oatmeal, salmon and peas, lamb and oatmeal, salmon and potato, salmon and potato for smaller breeds, and turkey and potato. This allows you to test different protein and starch combinations to determine what is best for your dog. The company also makes an extra flaxseed oil variety and grain-free formula. You can opt for any option that does not trigger allergy symptoms in your dog. All of these formulas have been specially formulated so that they can easily be digested by pets with chronic digestive problems. The protein sources are carefully selected to avoid any residual contamination from meat leftovers, while the carbohydrate sources are carefully picked to prevent gluten contamination. Do I need a prescription to buy this? No, you don’t. Customers can purchase Wellness at most pet stores and online. With so many single-source protein choices, Wellness Simple Natural Ingredients is one of the best options you have in hypoallergenic dog foods. If one of these formulas doesn’t work, you can always try another one from Wellness. Created by a former pet store employee with his own tailor-made minimal ingredient recipes, PS for Dogs has quickly become one of the most successful hypoallergenic dog food brands. The reason for the sudden popularity? It is effective. As simple as that. Unlike typical dry food formulations, PS for Dogs uses a ‘raw food’ quality air dried jerky which contains a single source protein in 90% grass fed, free range lamb from New Zealand. Secondary ingredients include essential vitamins and minerals. PS for dogs has a very personalized approach towards their customers. After buying their formulas, you receive a series of emails from the founder which guide you on how to introduce the food to your dogs and also a series of best practices that can be used to avoid triggering further allergies. No, you don’t. PS for dogs is sold over the counter. It is backed by a 100% money back guarantee. If the dog food does not work for your pet, then you can always claim a full refund back. 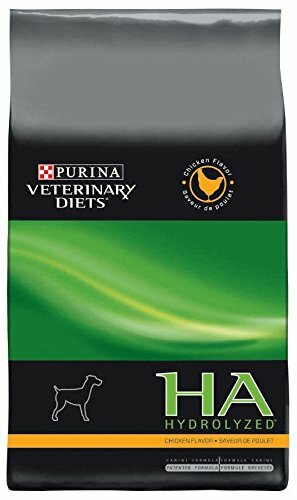 If you are looking for a hypoallergenic food, look no further than Purina HA. The protein molecules in the food are broken down into smaller amino acids. This helps support receptors in a dog’s intestinal wall and control allergic reactions. Vets consider this one of the best hypoallergenic foods, especially in the case of skin allergies in dogs. Purina HA also eases symptoms like tummy disorders and itchy skin. However, you need to wait for at least eight weeks to see improvements. It takes time for your dog’s system to stop having allergic reactions and adjust to this particular food variety. Take note that if you prefer vegetarian food options for your pooch then go for Purina HA vegetarian dog food without giving it a second thought. Pet owners can buy Purina HA at specialty pet stores and online. 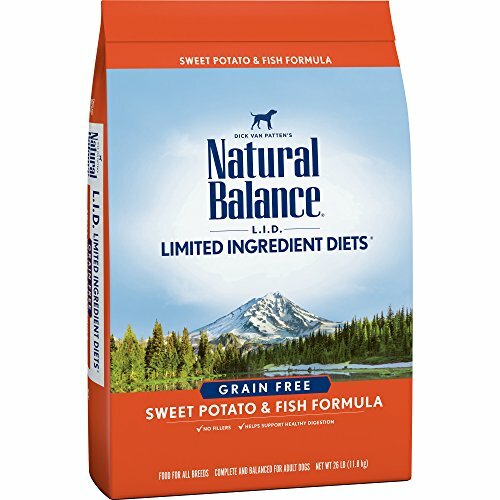 Natural balance is well-known to dog owners. To overcome or to stop the occurrence of skin allergies in the first place, natural balance’s limited ingredient can become your ultimate choice. When the company says they use the best ingredients to produce a high-quality dog food, they mean it. You can judge it by their frequent use of sweet potato as a source for carbs rather than potato. You can also find the salmon and flaxseed nutritional blend. The purpose of using flax seeds along with salmon and sweet potato is to provide more omega-3s, fatty acids, and DHA to your dog. Therefore, if your furry friend has a skin allergy, try the natural balance formula, which is designed to fight allergens and to provide a shiny and healthy coat. Customers can find this limited ingredient dog food online and pet stores. Last but not least, we have the #1 selling hypoallergenic dog food – the Taste of the Wild Dry Dog Food. It is designed to mimic the kind of balanced and nutritious food the dog would get if they were living in the wild. Marketing gimmicks apart, here is what you need to know. The protein sources are extremely diverse and veer towards the exotic. You can choose roasted bison and roasted venison, pacific stream canine with smoked salmon, wetlands canine with roasted fowl, rocky mountain feline with roasted venison, and smoked salmon. To increase the nutritional value there is a blend of fruits and vegetables added to the recipe. This is a high quality and well-balanced dog food. You can be assured that you are not compromising on any nutritional requirements. Taste of the Wild is 100% grain free dog food that is immensely popular among pet owners because dogs take an instant liking to the taste. Also, these novel protein sources eliminate many common types of allergies. No, you don’t. Customers can purchase this product online and at specialty dog stores. Pet owners give it to their Labs, Terriers, Bulldogs, Shih Tzus, Pitbull, Wolf hybrids, Pomeranians and even Pugs. If the label gives you an impression that this is meant for large sized breeds, you are mistaken. There are many internal and external factors that trigger allergies in your furry friend. Once you detect unusual behavior or symptoms in your dog, schedule an appointment with the vet immediately. With proper examination, you can identify the factors that are responsible for the allergy.